Smartphone, DSLR camera, compact camera, tablet… most of us have several devices that take and store photos. Then there's the desktop PC or Mac and/or a laptop, all crammed with photos. We're all drowning in data and fear that a device will get lost, or a hard drive fail. One answer is to upload all of your photos to one easy-to-use online archive where it's backed-up and, if you're lucky, all grouped and arranged for you. UPDATE: As of January 2019, Flickr will limit its free option to just 1,000 photos. This is down from 1TB of storage. If you don't choose another free service before this, you are at risk of Flick deleting your images until you get down to just 1,000. That's the dream. In practice, choosing a good cloud storage platform doesn't mean the end to photo editing, sorting or physical backup. However, some platforms do now involve some semblance of automation, with geotags and metadata used to group together photos by location, date taken, who's in them (using facial recognition), and the camera or device with which they were taken. Some are better than others. As usual, the free services usually come with strings attached, and only if you pay a monthly or annual subscription do you get to sample the best features. However, if you're prepared to make some often very small sacrifices, it's possible to get a lot for nothing. Here's a look at the best free cloud storage options right now and what to bear in mind with each one. This is the big one. As long as you agree with its restrictions on image quality, Google Photos will automatically upload and backup every photo you ever take on a smartphone (when it's on Wi-Fi), and extract every image it finds on your computers. What's more, it does it all for free. However, there are a couple of catches; as it uploads your photos, it will downscale them to 16MP versions, and reduce any 4K videos it finds to Full HD 1080p quality. If that doesn't appeal, and you'd rather upload in maximum quality, that's OK with Google, but it will then restrict you to storing 15GB. That's quite a downgrade from 'unlimited', but it's relatively generous. Still, even if Google Photos isn't perfect for professional photographers, it's still a pain-free way of backing-up a phone and keeping a usable copy in the cloud of every photo you've ever taken. Once everything has been uploaded – something that takes a while, obviously –Google Photos has all kinds of algorithms on board. Auto-enhancing, automatic tagging, image recognition to find your face and group together anything with you in. There's also an animation creator that will create occasional GIFs from burst sequences, and slideshow video options too. Despite these playful features, Google Photos is genuinely impressive software. Plus, a mind-boggling 1.2billion photos are uploaded to Google Photos each day, so algorithms will likely keep improving. Though Dropbox is a rather simple cloud-based file storage service, it's particularly good for photos. Unfortunately, the free version isn't much use since new users get a paltry 2GB of online storage – that's not going to stretch very far. However, it's worth experimenting with if you're the type of photographer who likes to store all of their photos in folders on a computer, and wants to keep it that way. Although it's a cloud storage solution, the Dropbox software installed on a desktop or laptop PC or Mac can be used to selectively sync folders. Once it's set up, it's simply a case of dragging and dropping photos into a folder that will then automatically sync. It's great for syncing files and folders across several computers. The Dropbox app can then be used to view your photos on phones and tablets, though it's also got a camera upload option that auto-uploads all photos taken on devices. It's been around since 2004 and there's something comforting about the almost retro design of Flickr. It's very photography-centric, presenting Exchangeable Image File (EXIF) metadata for each image – including aperture, shutter speed and ISO – as well as the chance to download it in a variety of resolutions. Perhaps the biggest reason to love Flickr was its 1TB of free storage, which was hard to resist. But as of January 2019, this will no longer be an option and you will be limited to just 1,000 images as part of the free plan. And there are another few reasons to swerve Flickr. The first is that the free version is an online photo management and sharing platform rather than a cloud storage backup service that syncs with computers. There is an app that can upload every image you take with a smartphone to Flickr, but that's slightly at odds with what Flickr is. Underlining its manual nature is its basic uploader; each folder or file has to be individually selected, and the process never seems to work without at least a few files being problematic. However, a $5.99 monthly fee gets you 'proper' auto-uploader software, while $49.99 per year brings discounts on Adobe Creative Cloud (including Lightroom and Photoshop), Prime Lightroom presets, and a Portfoliobox Pro website. 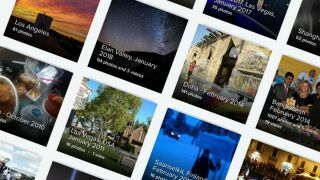 Best thought of as a lighter version of Google Photos, Canada-based Shoebox has been around since 2012 and is beginning to look a little dated. Although it offers more than enough for the casual user – and comes with an auto-uploader app for phones, a desktop client, and online access – the free version of Shoebox insists on reducing the resolution of photos uploaded to its site to just 10.6MP (3,264 pixels on the longest side), which does seem limiting – and it's significantly less that what Google Photos offers for free. There's also a ban on 4K videos, with Full HD 1080p videos limited to 3 minutes each, and 15 minutes in total. An additional hour of video costs $4.99. For US$5 per month on the 'Pro' plan you get original resolution backup, but this is not a good plan for videographers since videos are limited to six minutes each, 10 hours in total, and must be in Full HD 1080p quality – ie no 4K. A portfolio platform will not appeal to photographers who can't bear to delete old silos of Raw files. If you're the kind of photographer who likes to keep piles of old images 'just in case', the likes of 500px will only appeal as a way to showcase your very best images. However, there are photographers who will very happily delete almost all of their photos, keeping only a few of their very best. If that's you, consider putting them on 500px, a community of over 13million photographers from 190 countries that's all about quality over quantity. As well as getting feedback from other photographers, it also acts as a platform for licensing, so members can make money.